It was Hazel who said we needed real stuffed foxes. Of course we did. “We stop at nothing to get a good photo”, she said. Right. Absolutely. (O.K. it was she who found the hire place but somehow it was me who pulled the short straw re picking them up). One hot sunny day, (almost the only such last year) I set off to Islington from Sussex. Yes, a bit of a hike but we couldn’t find foxes in Sussex so off I go. It was very relaxing on the train; all the rubbish on the track was temporarily covered by brambles and bluebells; the train seemed to meander like a river, a lazy day lost in time. I cross London and tramp past the Angel, (note Angel that’s us) up the Essex Road, which hasn’t changed at all since I worked in North London, you need to watch out for yourself as well as hang on to your bag. Not that easy when you are carrying two stuffed foxes, as I soon discovered. The hire shop was on a corner. Entry was via a couple of metal grids and very rusty giant padlocks. Inside there were all sorts of animals waiting to be borrowed; lions, tigers, poor moggys, parrots; it was a veritable cornucopia of dead and stuffed creatures. I decided not to hang about. There was no entry system; you had to hammer and wave and basically look pretty stupid. Not as stupid as you do carrying the foxes though. I stood on the street corner trying to hail a taxi, holding one fox by the scruff and awkwardly hefting the other over my shoulder. The foxes had been handed to me in what can only be described as bits of black bags, so they were scantily clad and barely disguised; in fact not. I did get a cab although the driver didn’t like the look of me at all and particularly not my cargo, but what did he expect on the Essex Road? Surely London taxi drivers have seen dead foxes before? What do they do The Knowledge for, if it is not to prepare them for this? There was no need for him to be quite so squeamish; after all I hadn’t murdered them myself. Still, I know he was glad to see the back of me, (he made this very plain), as I stumbled out at London Bridge. On the train it got worse. I sat in the suitcase area so the foxes didn’t get squashed or damaged; (they had to be returned in perfect condition and I wasn’t about to argue on this point with medallion man the Islington dealer). Still I caused a bit of a fracas. Teenage girls saw the dead foxes and screamed, middle-aged ladies asked if I was part of a hunt and a bevy of nuns came to take a closer look, peering and chortling ho ho ho. I was very glad to get home. 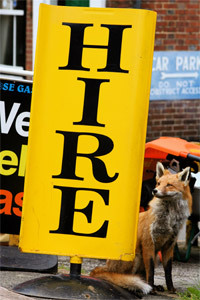 You might not know this but stuffed foxes are in great demand and expensive to hire. We had to crack on straight away with our film; to take these foxes back late would be a lot worse financially than an overdue library book. So it was a case of film, camera, shoot. Our, (we felt they were “ours”), foxes came everywhere with us; in and out of the landrover, in and out of our office, in and out the hire shop, on location in gardens, fields and hedgerows, up stairs and up ladders, up up up…….culminating in our great finale on the roof of The Old Fox House. (Of course). We and they were non-stop for two days before they had to go back to town. The funny thing was I drew the short straw for the return journey back to the Angel. Yes Hazel, “we” will do anything to get a good shot. On the way to the bookshop to pick up career books for my sixteen year old daughter so she does not always live at home eating ice-cream in her dressing gown and watching Channel Dave I pass the Bobbie Brown counter. Accidentally, well sort of accidentally. In fact I deviate pass this counter quite often. Sometimes I hover about for a few minutes, sometimes I stop and look, and sometimes I hurry away. But mostly I just take comfort that it is there. But today I march right up to it and gaze at the lovely earth-coloured eye shadows. “Can I help you?” says a pretty young girl with glowing skin. “Oh no, just looking” I say and I do a sort of side-step. But suddenly I become very bold. I blurt it out. Rather in the manner I once told my GP I thought I was having a nervous breakdown. “Yes, I do need help….a lot of it” and I explain about my discontinued Clarins lip colour, how I feel I am becoming obsolete myself and there must be some blusher, [medication?] something that will do the trick. Ten Years Younger? I never watch the programme as a matter of principle, but somehow it has got into my synapses. “Would you like to make an appointment for a free make-over?” “No….Yes, well how about today?” Can you do me NOW?” I feel if I don’t settle it this minute the moment will pass never to be retrieved. So suddenly she and Bobbie’s other girls have no chance, they are stuck with me. They make pretence of looking in their book, hoping it is full, but it is as clear as day that they had no customers this afternoon. There had been a power cut in the shopping centre for a start and everyone has gone home. One of them was going to have to step up to the plate for this Nicky Hambleden-Jones wanabee. The other girl suddenly found another customer so the first girl, who was in fact brave and sweet showed me to the stool as if she were a dental assistant ushering a nervous patient. I felt a bit like a contestant on The Weakest Link, (I make a point of not watching that either); the one who was going to be voted off first. The first question stumped me. “Have you any idea of the look you want?” I went blank. (I was the weakest link). I wanted to say I want to be like you, (she was 20…maybe 21 with flawless olive skin & smoky eye-shadow) but I could see that this was an expectation too far even for Nicky herself. (Apparently she has been replaced on her own programme for being too old, which although of course I never watch this programme still seems totally unfair). As it was, if I’d been setting out for a make-over and pre-booked my appointment I’d have worn my Joseph jacket not my Peruvian cardigan, [this principle is important when you visit the hairdresser nobody wants the knitted jacket type hair cut] but too late; however I managed to say, (quite intelligently I thought) that I wanted her help to look as good as I could for my age. She started off with “Bobbie’s favourite product”. Out came pots of lovely goo, like oil paints, such divine creamy colours. I tried to ask one or two sensible questions [as if I had free makeovers as a matter of course] and was told I could look in the mirror whenever I liked. Which I didn’t like. This meant finding my glasses and getting in and out of the hot seat. And besides I try not to look at myself in my glasses. What would be the point? The top buzz-word these days seems to be “low self-esteem”, so why encourage more of it? Actually without the glasses I was quite pleased with the effect. She said I didn’t have dark patches under my eyes, (what she meant was like some women of your age) which cheered me a lot. She seemed confident that she was making me look better and kept referring to my new glow. 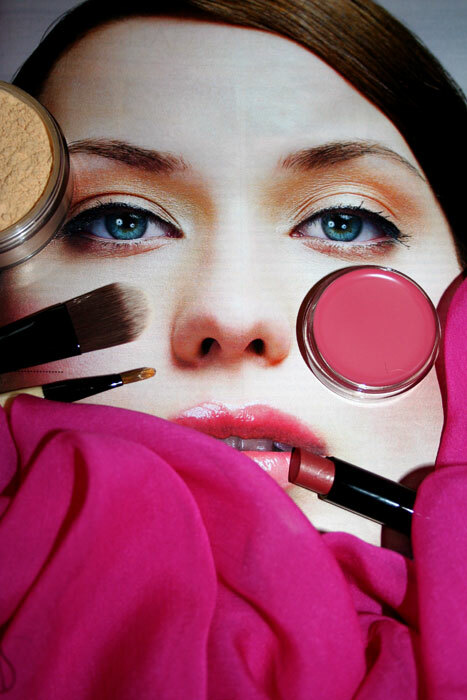 So on went concealer, foundation, powders and lipstick; “old rose” was the lip colour she thought suited me when normally I go for rust or orange; I haven’t used old rose since I was trying to be Jean Shrimpton, stealing my mother’s lipstick from her hand-bag. The sixties no-make-up-look had obviously come round again, especially when she applied kohl to my eyes and I started to look like Dusty Springfield [not that my ingénue make-up girl would have had a clue who she was]. The high stool became rather uncomfortable after a while but I persevered. In fact the make-up all seemed to feel very nice, especially as the girl told me it was Bobbie’s favourite look etc. etc. I was beginning to fall for the patter hook line and sinker. She asked me if I needed it done for a special occasion and I racked my brains and thought of my step-daughter’s wedding in June which I then brought forward a few months, aware that it is usually the bride who has a make-up practise and not the step-mother witness. So all too soon it was over. She asked me if I wanted to buy the products. Well of course I wanted to buy the products!! I had to jump now I’d got this far. What was the point of looking ten years younger and having Bobbie’s glow just for five minutes when the whole effect could last a lifetime?!! Because we are writing a book on teenagers we have taken a great interest in the “Julie Myerson case”. This is a strange situation for the author to find herself; the oxygen of publicity surrounding her novel suffocating and strangling her family. Was it intended or did it all get out of hand? Is “The Lost Child” a (de facto) bestseller but with too high a price? A writer should not be blamed for fictionalising her story, however lightly; although I think what is critical in this case is the timing. It would have been wiser for her to have recorded her experience and her agony but then sat on the material for several years before turning it into a book. Nineteen year old boys are un-worked clay. They are forever testing the water, getting into scrapes, over-reaching themselves, causing havoc; in other words working out their own value systems and learning by mistakes and losses, just as we all did. Teenagers hate to be corralled or manipulated. (Witness Bristol Palin’s nineteen year old boyfriend who has just done a bunk). They see straight through therapy-speak. In these situations they just look for the exit, in some way or another. It is too early to tell how things will turn out. What is almost a dead cert is that during his twenties Jake will have more adventures and some of these will turn out to be good. What Julie has done by creating infamy around her son has made it impossible for him to creep back under cover of darkness without loss of face. By going public so soon she has created a fissure unlikely to heal. Nobody will believe us but Fox & Angel came up with the slogan MAKE DO & MEND long before anyone else; before the crash, the crunch and the squeeze. Of course we know it is not new. I first saw this slogan at Art School when I was writing a dissertation on art in World War Two. And in any case the concept was in my blood; my grandmother had been a dressmaker; I used her rag bag to dress my dolls, and I made all my own clothes (and I mean all) for a decade from the age of fifteen. Such productivity ended the year I cut out costumes for the entire cast of the “The Gondoliers”; I realised I had out-sown my strength. Unfortunately since sewing is no longer taught in schools I am wondering how the mend part of make-do is actually going to work? Art students are great at creating looks and know the way of mixing a jumble sale fifties skirt with a pair of up to the minute shoes but I don’t see this flair in my local high street. Down here in Sussex all you see is ghastly trainers and track pants; if you suggest to people that they go more colourful red track pants will be it. Florida seems to have come to the UK but in grey or mushroom, (although admittedly this is better than turquoise). Even if it’s called taupe or charcoal it’s still beige or grey. The worst thing is the contagion; I have found myself shopping in old sweat pants “because it’s only local”, what the hell, no one will see me. It is said that women express themselves in clothes. Well, not here they don’t. Or only as a long running tragi-comedy. And what applies to the people is even truer of the buildings. I hate to think what effect make-do will have on the buildings. It seemed to be the mantra even before the down-turn. We are no longer a visual nation. Our medieval buildings were beautiful, our Georgian cities were striking, there is majesty in our great Victorian town halls but since then it has been all down-hill. I don’t want to necessarily embrace the “Neo” look…. (Poundbury etc.) but something has badly gone wrong. Even our great new architectural projects lack the vision and bravery which is so obvious in Paris, Berlin and New York. We major in dull as ditchwater, (which happens to be the colour of the river that flows through my nearby town). Our streets are grubby, we look lumpen and as a nation we are ashamed. Even in the good times the only “improvements” were dodgy replacement windows. The flat roofs remain; so do the run down thirties tudoresque, and all manner of fill-in badly-proportioned buildings. And if we do try to up-grade our town centres they are bulldozed and with the wave of a counsellor’s wand magic-ed into fairy castle supermarket architecture. The first one must have been “designed” but the rest were plonked down just about anywhere. England is supposedly a country with strict planning laws. Not where big business is concerned it isn’t; not that you can see anyway. A new development means a large bulldozer and a rolling out of wall to wall concrete. Conservation is a lip-service word usually applied to a flower bed full of wood chippings and dried out plants. Sometimes bald patches of barren, neglected land scattered with litter, are brazenly sign-posted “conservation areas”. To compound the problem most builders themselves seem to be completely non-visual; aesthetics obviously isn’t taught at construction college. Leave the average painter and decorator unsupervised for five minutes and your apple-white will have turned into magnolia because they had a tin left in the van. It’s all the same to them. This is the supreme danger of “make-do & mend”. It won’t be colourful, quirky and charming; it will be magnolia. This lack of upkeep, not to mention the look of the thing, is no more obvious than in our railways. I made a journey to London last week on our local line. The ticket office was unmanned, the train seats were filthy, the one loo that was working had no paper and the rail cutting was swathed with litter and detritus. Where attempts had been made to paint or fill cracks it looked as if it been bodged by a load of amateurs; gimcrack and cheapskate. We don’t do big projects well (remember the Dome and the Tunnel) but we do small ones even worse. There needs to be a sea-change; we should have ambition and want to see beauty again in our streets as well as our countryside. We need more green spaces, clean pavements, flowers and plants and that old-fashioned thing civic pride. It is something of an irony that it is Bill Bryson, an American by birth, who can see Great Britain more clearly than we see ourselves, who is trying, (without much success it has to be said with this intransigent, stubborn nation; our stoicism undoubtedly works against us in peacetime) to spearhead a “Clean-Up Britain” campaign. What England needs during the next decade is nothing dramatic. Maybe we should even put vision and beauty, (too highfalutin?) on hold for the future? Perhaps this is a mind-set and expectation too far just now. Perhaps better to aim for a lick of paint and a general clean up. During recession, we are sure to have the surplus man-power. Is this kind of “make-do & mend” really so much to ask? At Fox & Angel we are worried about the postal service. Will Peter Mandelson’s sell-off improve delivery here? Although we are fortunate to have a jolly postman (with very sturdy legs who always wears shorts), during February a number of important letters have failed to arrive. Nothing on Valentine’s day (no love letters at all in fact), nothing from Working Title to say they adored our screen-play, (perhaps due to the crisis they never even received it? ), no six-figure book deal from the poshest agent in London, nothing from the Green Party to whom we offered our services practically free because the Tories were short-sighted enough to turn us down and nothing from HSBC to say that their shares have doubled allowing us enough money to buy a state of the art Apple Mac. The whole thing has been completely mystifying; we can only hope with part-privatisation things will dramatically get better. In the news last week there was a nuclear submarine collision and cover-up, another Madoff-type scam in Antigua, (run on bank, man goes missing), and a helicopter crash in the North Sea in which the pilot seemed to think he had landed on the rig but found himself in the water. These men are let loose around the globe but here in Sussex classroom assistants cannot put pictures up on the walls of their classrooms unless they have undergone “ladder-training”. Question: would the world be in a better or worse mess if nursery nurses (standing on tables with the intention of using blu-tack) were running the whole show?